We’d love your help. Let us know what’s wrong with this preview of On the Way to Simple by Jennifer Acres. This couldn't happen. It wasn't part of her plan. She hadn't even worked up the nerve to tell him she loved him. Dakota Ames had everything under control, or so she thought. This couldn't happen. It wasn't part of her plan. She hadn't even worked up the nerve to tell him she loved him. Alex was wrong to go and she was going to prove it. To ask other readers questions about On the Way to Simple, please sign up. This book. I can't say enough good things about it. Ms. Acres wrote a beautiful story of friendship, love, family and loss. The main character, college senior and wannabe professional party planner Dakota, can't function without a plan. When she decides to tell her best friend since forever, Alex, that she loves him, she ends up backing out, afraid of the consequences. Dakota also hates "uniforms," because of something that happened with her father, a former fireman. When Alex enlists in the Nav This book. I can't say enough good things about it. Ms. Acres wrote a beautiful story of friendship, love, family and loss. The main character, college senior and wannabe professional party planner Dakota, can't function without a plan. When she decides to tell her best friend since forever, Alex, that she loves him, she ends up backing out, afraid of the consequences. Dakota also hates "uniforms," because of something that happened with her father, a former fireman. When Alex enlists in the Navy, becoming a "uniform" himself, she has a freak out. Her plans are falling apart at the seams. Then she meets Alex's fellow Navy recruit, Will. Dakota starts to fall for Will (you will too). But... uniforms! But... Alex! But...plans! Do you see where this is going? Because this book will take you on a ride through every emotion under the sun in the best way possible. The relationships between Dakota and Will, Dakota and Alex, and even Will and Alex are all distinct and developed perfectly. One of my favorite relationships in the book is Dakota's relationship with her best girlfriend and roommate, Kaylee. Kaylee is pretty much the polar opposite of Dakota, but the connection they share is evident--you always feel the love between these two, even when they're fighting. Beware: This book will make you cry. I'll admit I hid in the bathroom and ugly cried, even the second time I read it. But it will also fill you with warmth, love, and most of all hope. I finished this book in one evening. Not something totally out of the ordinary, but a sign that it really kept me interested. I laughed (maybe once or twice). I cried (I was not expecting to cry). This book was somewhat predictable while being totally interesting at the same time. I had a feeling about what was going to happen, but I enjoyed the journey. I really liked the main character, Dakota. She is a good person while having some flaws. I wish we could have learned more about some of the sup I finished this book in one evening. Not something totally out of the ordinary, but a sign that it really kept me interested. This book was somewhat predictable while being totally interesting at the same time. I had a feeling about what was going to happen, but I enjoyed the journey. I really liked the main character, Dakota. She is a good person while having some flaws. I wish we could have learned more about some of the supporting characters, like Dakota's friend Kaylee, but also Will and Alex. The author gave us some of Alex's point of view thrown in in the form of letters. Considering how much of the time passed during the book involved communicated through writing, there were not too many letters or text blurbs included in the book. Sometimes I can get inundated by all of the messages, but that was not the case here. I did find that the whole time I was rooting for Alex and Dakota. Will (the second love interest of Dakota) is almost too good to be true and because Alex is introduced and included more, I found it hard to really take Will and Dakota's relationship seriously (even though I should have). A beautiful tearjerker dealing with love and loss. Well-written and realistic new adult romance! I should probably start off with saying a little bit about the book. But I feel that would do it no justice, also the blurb is enough. I was given this book to review. So the first ten pages, I thought I knew how the book would end. I thought either it could go cliché or just the type of book I need to be reading right now, e.g. an uplifting read. The more I read about Dakota and Alex’s relationship and the conversations I have, I automatically think ‘H I should probably start off with saying a little bit about the book. But I feel that would do it no justice, also the blurb is enough. I was given this book to review. The more I read about Dakota and Alex’s relationship and the conversations I have, I automatically think ‘He must like her too, predictable but yet why can’t she see that? Is she stupid?’ But on the other hand I also do not see when perhaps someone likes me in that way or flirts with me. Basically what I am trying to say is that Dakota is really relatable to me, but only when I am feeling open enough in myself to admit to such faults (well, we can’t all be perfect). I felt like I never truly got to know Alex in comparison to other characters. But I loved him all the same. I think that we don't get to really know Alex because he is a reserved guy. I am so on board with the love triangle in this book. I have never loved one so much since Twilight, yes TWILIGHT! It sounds like a love triangle but it's not really, is it? It was for me, and I LOVED it! A wonderful and heart warming story of friendship, love, acceptance and the beauty of life. This is a story that will tug at the heart strings of the reader. The ups and downs of life are beautifully portrayed in this story and it's a pleasure to see the characters grow into stronger people. Dakota, the main protagonist, has a plan for everything. She thinks that she can control the direction her life takes, including how everyone close to her affects it. What she doesn't realize is that plans ar A wonderful and heart warming story of friendship, love, acceptance and the beauty of life. This is a story that will tug at the heart strings of the reader. The ups and downs of life are beautifully portrayed in this story and it's a pleasure to see the characters grow into stronger people. Dakota, the main protagonist, has a plan for everything. She thinks that she can control the direction her life takes, including how everyone close to her affects it. What she doesn't realize is that plans are never set in concrete and life is ever-changing. She is severely affected by the trauma of her father's accident and the job he used to do, which lead her to be the way she was. Alex, the best friend, has also seen his share of problems in life and in spite of everything, has always been by Dakota's side. It's a deep friendship, stemming right from childhood. The author brings out these minute details in the character's lives and the introduction of Dakota's best friend adds more substance to the story. She is so different from Dakota, but is perhaps one of the most caring and time proves that their friendship is very strong. The story revolves around how Dakota meets Will, a Navy recruit and falls for him against all her plans. In parallel, she is also dealing with the fact that Alex has enlisted and she feels betrayed by the same. What follows is a test of the strength of their friendship, their love and all that matters to the people involved. I had a few issues with this but overall I really enjoyed reading it. my review will be up on Books Are My Fandom soon! On the Way to Simple is a deceptively poignant novel: I wasn't expecting to be sucked into a world with refreshing prose and poise, but I was. This is one of those books that leaves you almost breathless when it's over; it changes you. I'm not alone in that sentiment by far, yet it bears saying again. Jennifer Acres has managed to tell a story that is absolutely earth-shattering and satisfying all at once - an emotional journey that won't be forgotten. The story begins with a young woman named Da On the Way to Simple is a deceptively poignant novel: I wasn't expecting to be sucked into a world with refreshing prose and poise, but I was. This is one of those books that leaves you almost breathless when it's over; it changes you. I'm not alone in that sentiment by far, yet it bears saying again. Jennifer Acres has managed to tell a story that is absolutely earth-shattering and satisfying all at once - an emotional journey that won't be forgotten. When I first agreed to review Jennifer's novel, I had planned on finishing off a couple of different books beforehand and sitting down to read it whenever I got the chance, but of course, that didn't happen! I had strayed away from my reading schedule for a few weeks now and I really didn't feel like going back to it. So when On the Way to Simple arrived, I couldn't wait to get my hands on it! In fact, once I took it out of the package, I couldn't put it down! I ended up reading the entire book in When I first agreed to review Jennifer's novel, I had planned on finishing off a couple of different books beforehand and sitting down to read it whenever I got the chance, but of course, that didn't happen! In fact, once I took it out of the package, I couldn't put it down! I ended up reading the entire book in one day! I completely shocked my husband, only taking breaks to eat, drink water, or go to the bathroom. He even went into a math frenzy trying to figure out how many pages I read per hour! Needless to say, I liked the book! And how could I not? Jennifer created a storyline that wasn't just interesting, but relatable to me as well. There are so many military spouses out there, including myself, and I know that a majority of them can relate to the emotions and events mentioned in the book. I didn't just relate on that level either, but I related to the book as a whole! Mainly with Dakota, of course. We are both planners, perfectionists, and pessimists. Like Dakota, I have very strict feelings on certain topics, partly due to the fact that I also struggle with anxiety. And I loved that mental illness made an appearance in Jennifer's book! I haven't found many YA books that touch upon that topic, let alone describe it accurately, so she definitely got some brownie points for that! And I have to say, I loved the other characters as well! Jennifer did a great job at making the relationships seem realistic. I actually began to feel as if I got to know each character and I cared about their life as well as their relationships within the story. I've read a lot of books that have unrealistic conversations or problems, but that was definitely not the case with On the Way to Simple. To be honest, I found it quite difficult to find anything wrong with this book. Besides a couple small errors that can be found in most ARC's, there wasn't really anything that jumped out at me. Admittedly, I wasn't a fan of some of the book's formatting, but that could just be the obsessive compulsive part of me! Honestly though, I think Jennifer and her team did a great job with the book! I absolutely loved her cover and it I loved the way that she brought elements of it into the book's interior as well, specifically the six circles! This story was so beautiful. Though it's not the usual kind of book I read, it was a pleasant and refreshing change. It was sweet and nice. I don't usually describe the story in my reviews and even for this one, I won't dwell much on it. The blurb gives a very good picture but also leaves scope for a lot of assumptions. My first assumption was that it is a love triangle and that was what made me pick this book, but I was wrong...sort of. Even if I do call it it a love triangle, it's not the typi This story was so beautiful. Though it's not the usual kind of book I read, it was a pleasant and refreshing change. It was sweet and nice. I don't usually describe the story in my reviews and even for this one, I won't dwell much on it. The blurb gives a very good picture but also leaves scope for a lot of assumptions. My first assumption was that it is a love triangle and that was what made me pick this book, but I was wrong...sort of. Even if I do call it it a love triangle, it's not the typical type. It's different and in lot of ways it is simplified. There are two guys - Alex and Will. Dakota does love them both but at particular instances of time, she is in love with just one guy.. okay I know it sounds confusing but in the book it is always made clear as to whom she loves. There are certain parts of this story which totally won me, melted my heart and even made me cry. It was beautifully written. The story by itself has a different vibe and pace to it but always maintains its simplicity and innocence. It's pure and unscathed by any people with wrong intentions or even grey characters. Everyone's good and nice..and the whole story is very situational. I liked all the characters especially that of Kaylee's and Will's. Even Alex though he has lesser 'book-space' compared to that of Will. I didn't like Dakota until the end where she actually begins to change. I kind of get her apprehension towards uniforms but still most of her actions were immature and reckless. Her ways of always sticking to and following plans kind of pissed me off. Not that I hated her but I was just not fond of her. She was nice n sweet..but still if she had made better choices she could have had a better hea I think. This story was not perfect and I can point out a few places where it can be improvised. Dakota's relation with her dad was not explored in detail and a lot of it was left for us to understand. If that were more detailed then accepting her dislike towards uniforms would have been easier. Even her childhood and closeness with Alex is just touched upon. Again if there were more scenes dedicated to their childhood, it could have improvised the chemistry they shared. First confession: at first I was a little wary of this book because, from the synopsis, I suspected there would be a love triangle involved, and I absolutely hate love triangles. But, the story sounded intriguing, so I thought I would give it a try anyway. Second confession: I am so glad I did! Dakota is absolutely a planner. She figures out a plan, and she sticks to it like her life depends on it. That is, until Alex enlists into the Navy, and she meets his fellow recruit, Will. Through her int First confession: at first I was a little wary of this book because, from the synopsis, I suspected there would be a love triangle involved, and I absolutely hate love triangles. But, the story sounded intriguing, so I thought I would give it a try anyway. Second confession: I am so glad I did! Dakota is absolutely a planner. She figures out a plan, and she sticks to it like her life depends on it. That is, until Alex enlists into the Navy, and she meets his fellow recruit, Will. Through her interactions with Alex, Will, Kaylee (Dakota’s roommate), and her dad, Dakota slowly learns the importance of keeping things simple. While Dakota’s obsession with plans might be a little much for some, she is also caring, and willing to combat her fears about being in a relationship with uniforms when the need calls for it. Which shows when Dakota plans parties / events for her friends. In terms of characters, I thought Kaylee, Dakota, and Will were very well-rounded, had flaws, and were relatable. I personally wish that there had been more of Alex in the book. With everything else going on, I think he was the least developed out of the main characters. Dakota and Alex have been friends for years, but we only catch glimpses of that throughout the book, and most of that is in past tense. Told, rather than shown. That being said, I thought the pieces that were given gave great insight into both Dakota and Alex’s characters, and their history. I just wish there had been a more of that. There is a love triangle, but it isn’t the classic “girl has to choose between two really great guys” cliché. It also made perfect sense given the characters, and the context of the story. The book will most likely leave you in tears, but it is well worth the read. Well done, Ms. Acres, well done. Warning: Please prepare tissues... my bed is now covered in them. I honestly did not expect to cry so much but this book really tugged on the heart strings. Seeing two best friends too afraid to tell each other what they really want and then life gets in the way of everything and splits them up that they don't even know how to mend their relationship. It was a little difficult at the beginning for me to accept what Dakota was doing - but in many ways, I can't blame her either. Her actions were a p Warning: Please prepare tissues... my bed is now covered in them. It was a little difficult at the beginning for me to accept what Dakota was doing - but in many ways, I can't blame her either. Her actions were a product of her experiences and she did have some growing up to do. Altho some of her jumping around made me a little irritated with her. Grow up she did and boy was it a painful (and tearful) one. The ending did feel a little rushed and it would have been nice to get more of the other person's POV to really understand his side of the story and his motivations for so many of his odd actions as well. This was a sweet story, albeit it had its sad moments too but, I still really enjoyed it. Dakota is the lead in the book who is ready to tell her best friend Alex she's in love with him. The only problem is Dakota doesn't like when things aren't wrapped up in a pretty little bow and she gets taken by surprise by Alex. Then she gets introduced to Will. I adored Will!!! He was perfect!! But regardless of how much Dakota likes life written and planned out things still go haywire for her. I genuinely This was a sweet story, albeit it had its sad moments too but, I still really enjoyed it. There is a love triangle. Dakota doesn't want to date a man in uniform. Her dad was a fireman and got injury. Alex is Dakota best friend and he loves her. Dakota finds out Alex enlists and gets angry with him. Will is in Alex unit. When Will first met Dakota it was instant love but she was hesitant. Kaylee Dakota friend gets married to Daniel right before they deployed. The twist at the end made me so angry. They still get their happy ending! This story. I don't have the words to describe the beauty of this story. I literally stayed up most of the night reading because it gripped me from the very beginning. There were times it made me angry and I wanted to throw things at the characters. There were times it broke me and I cried. But it also had me smiling, clutching my heart with the perfection of it all. Ms. Acres has definitely joined my must read list!! This was a good story. However prepare to be devastated. It will make you cry. I thought the end could of been better the author could of at least included an epilogue with more to the end story. Overall it was a really good book it was hard to put down once I began reading. This novel was incredible. Emotionally endearing with a cast of amazing characters as well. It was extremely well written and I can't rec it enough. Ms. Acres is definitely my new autobuy author. On the Way to Simple is a well written, engaging story of friendship and love. Jennifer writes beautifully and the prose is enjoyable. Dakota is a character, who based on previous life experience, struggles to operate without sticking to plan; there is little room for variables or unknowns. When her life gets thrown into crisis by an unknown being realized, she finds herself on a journey toward a simpler life of embracing the unknown, though it feels like it may be the death of her. There are som On the Way to Simple is a well written, engaging story of friendship and love. Jennifer writes beautifully and the prose is enjoyable. Dakota is a character, who based on previous life experience, struggles to operate without sticking to plan; there is little room for variables or unknowns. When her life gets thrown into crisis by an unknown being realized, she finds herself on a journey toward a simpler life of embracing the unknown, though it feels like it may be the death of her. There are some really memorable poignant moments in this book. I think of one scene in particular, but I can't really talk about it due to spoilers. All I will say is that the way Jennifer wrote that scene, it will be etched in my memory for a long, long time. There are few scenes in books that become a permanent part of my memory. Some characters are certainly more likable and relatable than others, but that's life. We don't get along with everyone anyway. I probably do not have too much in common with Dakota, but as a guy, I found myself gravitating towards Alex and Will. I could connect with whatever they were dealing with and going through. It was hard to root for one guy over the other, because they were both good guys. I'll begin this review by saying that Jennifer Acres has a beautiful writing style, which I really liked. As for the story, I enjoyed it for the most part. I loved Will and Alex, they were both so sweet; I loved their characters. Dakota, on the other hand, was very unlikable. I tried so hard to like her character, but I just couldn't. I couldn't connect with her; she was very immature, self-absorbed, way too controlling, and extremely selfish, which is the reason I took 1.5 stars off my rating. Also, as an undergraduate Psychology student, I just could not understand how someone with panic attacks can so easily deal with them, without the assistance of therapy. The "big" thing that happened 3/4 into the book was a bit expected. Overall, the story was intriguing despite some of the aspects I disliked. It kept me wanting to know how the story will end. I would recommend reading it either way and make your own judgement about the book. The characters are very relatable and realistic. When we assume we have it together, our arrogance blinds us in the decisions made. We take for granted those we need and love the most. I was angry with Dakota and Alex on a lot of their decisions. Several times, I had to put my kindle down to give myself a mental break because I was so mad. I felt the confusion and uncertainty from Dakota. I could totally relate to her abandonment issues and how her life basically was driven by that fear of it. D The characters are very relatable and realistic. When we assume we have it together, our arrogance blinds us in the decisions made. We take for granted those we need and love the most. Dude, Alex, is seriously intense for me! The love he has for Dakota is remarkable. I don't think I could have been that patient with someone I loved. I loved the journey of this story! Confused, awkward, arrogance, grief, denial and the different forms of love! A read I highly recommend and give you fair warning, grab tissues and a comfortable spot to curl up in. It's definitely a ride you'll enjoy! This book will truly rock your world. not only is it stunningly beautiful, but it's also poignant and filled with heart. Simply put? I loved it. 3.5-4 "I'm going to keep this review as vague but informative as possible so I can keep the spoilers tag off stars" lol! Okay so... this book tricked me. It's a love triangle, but not really at all. There was no cheating (thank goodness), and it was always clear who she'd end up with. I'm kind of disappointed in this book, but kind of not. In this book, Dakota is with two different heros at two different times, but like I said earlier, you kinda already knew how it'd end. I did anyway. There was a 3.5-4 "I'm going to keep this review as vague but informative as possible so I can keep the spoilers tag off stars" lol! I loved Dakota with the hero she was with in primarily the entirety of the book. I thought they were great together and really really loved seeing her happy. I would've liked her with the other hero too (not at the same time of course), but the author made it so her and the main hero were perfect together so of course I had to adjust my shipping lol. The only reason I was really disappointed was because of the way the heros swapped out in being with the heroine. Given, a lot of time passed between the swapping but I don't know... if the book goes from 0-90% of her being with one guy and then at like 91 or 95%-100% (no joke I was looking at the percentages at the corner of my kindle lol) she starts over with the other guy... idk it just wouldn't click the same. I wish it did though. Because the guy was great. Saying that, still I'd like to say I shipped her with both guys though because they were both amazing guys, and I thought they both would make great couples. It was just the circumstances that gave me trouble adjusting with the change. Not the character. Just the timing. •Dakota — lovable but frustrating with her selfishness at times. Through perspective, you could understand where it came from but that only sometimes made it less frustrating. She was very organized and needed stability to be sane, and I personally never judged or got angry with her for that. Because I understood. Especially given her background and things which if wasn't clear to anyone, you can get towards the end. Luckily, I didn't need until the end to understand it though. Overall I loved the girl. Yeah everyone else was just background. This book was great, and I really enjoyed it. 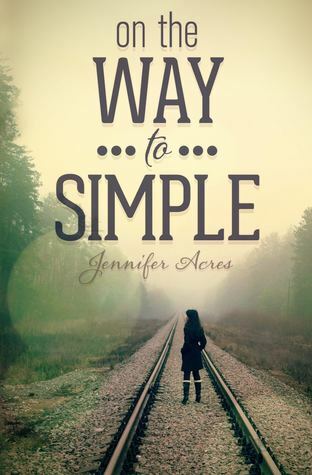 On the Way to Simple by Jennifer Acres is a standalone novel. I was provided a free copy in exchange for an honest review. On the Way to Simple is about a girl named Dakota who lives by having plans. She has planned out her life, her future, ever since the death of her father. And in those plans, her childhood best friend Alex is supposed to remain her friend. Nowhere in her plans does she confess her true feelings for him. And especially nowhere in her plans was Alex supposed to enlist i 4 STARS! On the Way to Simple is about a girl named Dakota who lives by having plans. She has planned out her life, her future, ever since the death of her father. And in those plans, her childhood best friend Alex is supposed to remain her friend. Nowhere in her plans does she confess her true feelings for him. And especially nowhere in her plans was Alex supposed to enlist in the Navy. But Dakota meets Will, Alex's fellow recruit, and she embarks on a journey of love, spontaneity, and loss; discovering the wonders of simplicity. Jennifer Acres does a fantastic job with the character development, the emotions that the characters experience, and the relationships between them. This was a beautiful novel about friendship and love. The love that Will, Dakota, and Alex experience brought me on a ginormous emotional rollercoaster that left me with both smiles and tears. I could definitely relate to Dakota and her fears about straying from plans, how the unpredictable can be quite frightening. But I loved how I could see how Will's spontaneity and simplicity helped Dakota to overcome her fears and emotional challenges. It was beautiful. For Alex's character, I could definitely feel the pain he was feeling for having lost Dakota's trust and potentially her friendship forever. I could definitely feel the loss he was feeling as he saw Dakota and Will become closer. At some parts of the book, the plot became a little slow and some scenes kind of dragged on too long for me, but the pace overall was good. The plot kept me captivated with the characters and their story. The ending, though. That made me cry tears of sadness and tears of happiness. Without giving any spoilers, I would say that the ending felt right. While I personally envision a different ending for my own personal fantasies, the ending that Acres created perfectly fit the characters and their journey. I won a copy of this book via the author's website. I'm not a huge NA reader, so I've decided not to give this book a rating - I don't want the author's average to go down just because I didn't get on with this book. The premise was good, the writing was very good and kept me reading to the end. I think, maybe, I'd have preferred a different outcome, but that really says more about me than the story. The confusion of loss and grief is handled sensitively. Part of my problem, in general, with NA bo I won a copy of this book via the author's website. I'm not a huge NA reader, so I've decided not to give this book a rating - I don't want the author's average to go down just because I didn't get on with this book. Jennifer Acres' writing experience began back before she attended Houston Baptist University, where she earned a Bachelor of Music in Composition. She wrote three screenplays both during her time there and after, all of which received awards from the Houston International Film Festival. After working as a script supervisor in Houston and L.A., she discovered that she was in love with story and wan Jennifer Acres' writing experience began back before she attended Houston Baptist University, where she earned a Bachelor of Music in Composition. She wrote three screenplays both during her time there and after, all of which received awards from the Houston International Film Festival. After working as a script supervisor in Houston and L.A., she discovered that she was in love with story and wanted to pursue writing novels.